Gelatin is an animal derivative that is used for setting sweet or savory liquids to create a jelly. When buying gelatin, you may find it in two different forms: leaves (or sheets) and powder. Although both versions are made from animal collagen, they need to be treated differently. Each will also create a slightly different outcome in the dish, so one type may be recommended over the other for certain recipes. There are also alternatives to gelatin, which are perfect for specialty diets that avoid animal products. Most people are familiar with using gelatin in desserts. The Jell-O brand and its many flavors play a large role in this association. However, gelatin is also included in recipes such as cold soups and fish molds. Although gelatin is needed to make certain candies and delicious treats like a cranberry mold, pannacotta, and homemade marshmallows, it has developed somewhat of a bad reputation. Much of this has to do with retro recipes such as ham in aspic and jellied beef mold, which can leave a bit to be desired on the culinary front. This is unfortunate, considering it is a necessary ingredient in several delicious and popular dishes. There's no need to pass gelatin up. A better idea is to learn how to use each form and look for recipes that are actually delicious, avoiding those that are just a little too bizarre unless you're up for an adventure. 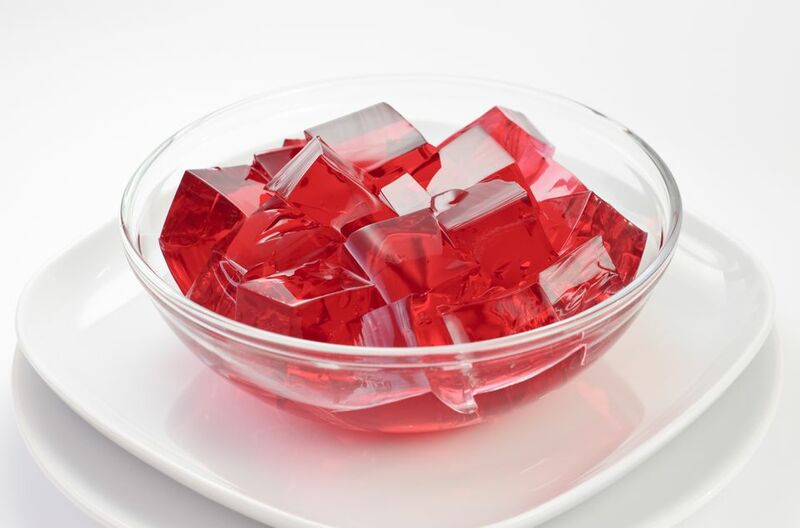 Gelatin is created when the animal collagen in the connective tissue, skin, and bones is heated slowly until it is broken down, creating a gelatin substance. Gelatin powder is made when this substance is dried out and then becomes individual grains. The powdery consistency allows the gelatin to easily disburse throughout the mixture it is added to. Also called gelatin sheets, leaf gelatin is made when the gelatin is dried into a flat sheet. Some consider leaf gelatin the more preferred setting agent in making a jelly, as it gives a very clear, clean, tasteless set. Cooks may find it easier to use as well since the measurement is simply counting out sheets versus weighing amounts of powder. Not surprisingly, since these two forms of gelatin are quite different, there are different techniques in how you will use them in recipes. For powdered gelatin, add a few tablespoons of warm water and stir for a few minutes until the gelatin is dissolved. Make sure to never boil any gelatin mixture as it will lose its thickening quality. If you are adding sugar to the recipe, mix it with the powdered gelatin before dissolving it in liquid. For leaf gelatin, soak the sheets in cold water for five minutes to soften them up. Then remove and gently squeeze the leaves to remove any excess water. If your recipe calls for gelatin leaves or sheets but you only have powder (or vice versa), don't worry. You can convert the measurements to meet your needs. One packet (1 tablespoon) of powdered gelatin is equivalent to four gelatin sheets. This is enough to soft-set 2 cups of liquid. Since gelatin is made from animal protein (most often pig), it is not suitable for vegetarians, vegans, or even those keeping kosher. There are vegetarian gelatin alternatives, including agar-agar, which is made from seaweed. It is sold in powder form, solid blocks, or in thin strands. You can also use arrowroot, guar gum, xanthan gum, pectin, and kudzu (an Asian plant).